Use Coupon Code: Cafe1 and get 10% DISCOUNT on 1st order! 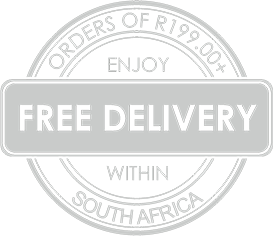 Orders of R199 or more enjoy FREE DELIVERY! Affogato – An Italian dessert drowning in espresso. Affogatos can be made by covering ice cream with strong coffee. A typical Italian Affogato is a scoop of vanilla gelato covered with a shot of espresso and served immediately. Affogatos should not have too much melted ice cream or gelato, and should be bitter-sweet with a combination of textures. 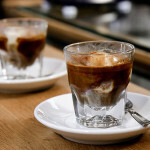 Popular Affogatos include Vanilla Affogato, Mocha Affogato, and Peppermint Affogato. 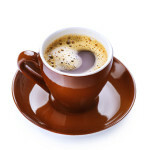 Americano – A coffee beverage made from a shot or two of espresso mixed with hot water to make a full sized drink. 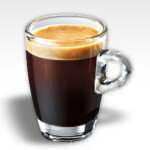 Americano is short for “Caffe Americano”, which is Italian for espresso coffee served American style. Biscotti – Biscotti, in Italian, refers to twice baked cookies. 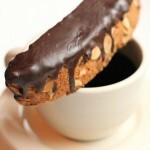 In North America, biscotti are mostly associated with coffee. A Biscotto (singular form of Biscotti) is a dipping cookie. In Italy biscotti are generally dipped into wine. Traditionally, biscotti were almond flavored. Today, because of their popularity in coffee houses, many different ingredients are added: dried fruits, chocolate, nuts, seeds, spices, etc. Biscotti are often served frozen with melted chocolate or frosting, topped with nuts or even coated with colored sprinkles. 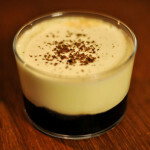 Black and White – An alcoholic drink made from one part coffee liquor, usually Kahlua, and one part milk or vanilla schnapps. Carefully layer 1/2 ounces coffee liquor over 1/2 ounces of milk, or vanilla schnapps, in a shot glass and serve. Black Eye – A cup of American coffee with two shots of espresso added. Also known as a Sling Blade, Depth Charge, Shot in the Dark, Cafe Tobio, Autobahn, or Hammerhead. Black Russian – An alcoholic coffee drink. 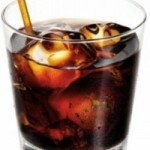 To make a Black Russian, fill a rocks glass with Crushed ice, add 1.5 ounce vodka and 1.5 ounce Coffee Liqueur. 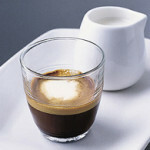 Breve – A milk based espresso drink made with half-and-half, or light cream, instead of whole milk. Breve means “short” in Italian, and in some locations refers to a cappuccino made with light cream. Cafe – French word for “coffee”. Cafe au Lait – Similar to a Latte, but made with filter drip or French Press coffee instead of espresso. 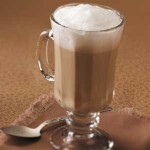 To make a simple Cafe au Lait, mix equal portions of brewed coffee and heated or steamed milk. 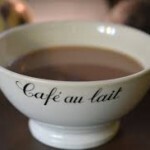 The “French” style is to serve a Cafe au Lait in a white porcelain cup or bowl. Cafe au Lait is French for “coffee with milk”. 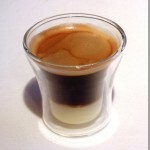 Cafe Bonbon – Condensed milk poured carefully over espresso and served in a small glass. The shot of espresso remains separated from the milk until stirred, as in a black and white. Cafe Bonbon is French for “candy coffee”. 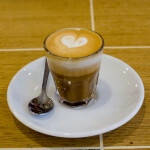 Cafe Noisette – Cafe Noisette is espresso with a small amount of milk added. Cafe Noisette is French for “hazelnut coffee”, a reference to the dark colour of espresso. Caffe – Italian for “coffee”. Cappuccino – A beverage made from espresso, hot milk, and frothed milk. To make a Cappuccino, add equal parts of espresso, hot steamed milk, and velvety milk froth. A dry Cappuccino is the same drink without the hot milk. Cappuccinos are traditionally served in a small cup, or demitasse. 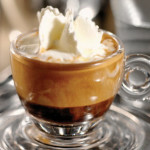 Espresso con Panna – Italian for “espresso with cream”, an Espresso Con Panna is a shot of espresso topped with a dollop of whipped cream. Espresso Granita – A slushy chopped ice dessert made from espresso. The word “granita” comes from the Italian the word “grano” meaning “grain”, a reference to the grainy texture of ice used to make a Granita. 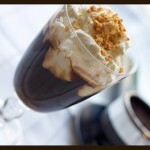 To make an Espresso Granita, freeze extra strong sweetened espresso, crush or chop finely, and serve in a clear glass topped or layered with whipped cream. Gelato – Americano coffee & Italian ice cream made from creamy milk and sugar with fruit, flavorings, and sometimes eggs added. Non-dairy gelato is known as sorbetto. 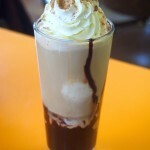 Iced Mocha – Caffe Mocha served cold with ice. To make an Iced Mocha, add chocolate to bottom of glass, add espresso and mix well, then add milk until the glass is two thirds full and mix well. 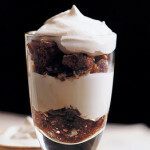 Add ice last, or pour into and ice filled glass, and cover with whipped cream if desired. 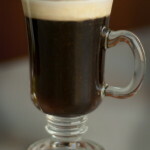 Irish Coffee – An alcoholic coffee drink. 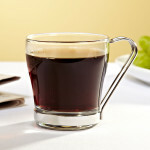 To make and Irish Coffee, pour a shot of Irish whiskey into a warmed whiskey glass and add three sugar cubes (3 tsp). Fill with strong black coffee to within one inch of top. Stir gently and top to the brim with slightly aerated heavy cream. Latte – A shot or two of espresso in a cup filled with frothy steamed milk. 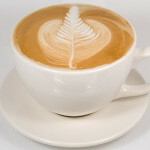 Baristas will sometimes pour the frothy milk through the espresso in an open mug to make an artistic design in the crema (espresso foam) floating on the surface. “Latte” is short for “Caffe Latte”, which is Italian for “coffee with milk”. Macchiato – Italian for “spotted”. There are two types of Macchiatos, “Latte Macchiatos” and a “Caffe Macchiatos”. To make a Caffe Macchiato, also called “Espresso Macchiato”, fill a small glass with espresso and dab a spoonful of velvety frothed milk on top. 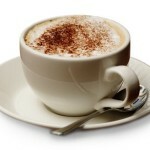 To make a Latte Macchiato, pour espresso into frothy steamed milk leaving a dark spot on top. 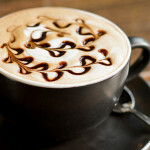 Mocha Latte – A Mocha Latte, or Mocha, is a coffee drink made from espresso, chocolate syrup, and steamed milk. To make a Mocha, coat the bottom and sides of the cup or mug with about 1/2 oz. of chocolate syrup. Add a shot or two of espresso and fill with steamed milk. Add whipped cream if desired. Red Eye – A cup of American style drip coffee with a shot of espresso added. Also called a Shot in the Dark, a Depth Charge, or an Eye Opener. Variations of the Red Eye include the Black Eye, made with two shots of espresso, and the Dead Eye, made with three shots of espresso.